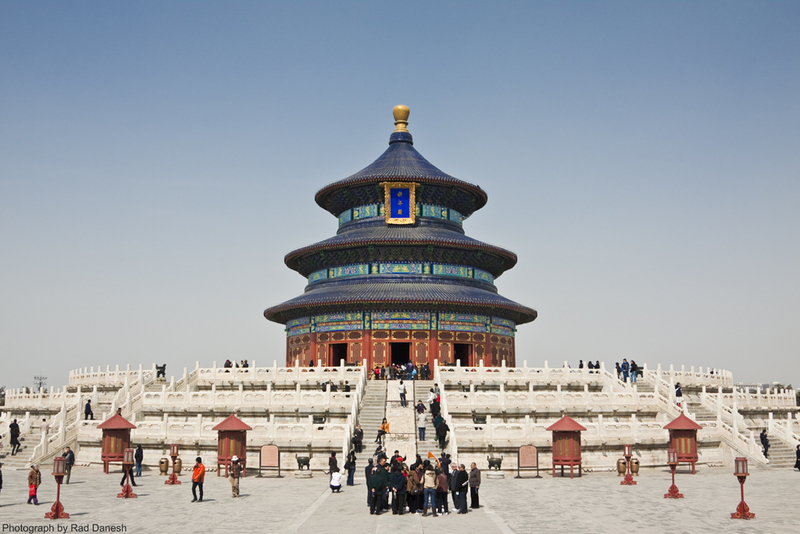 The Temple of Heaven, or Tian Tan, completed during the Ming Dynasty. It is one of the largest temple complexes in China and a paradigm of Chinese architectural balance and symbolism. It was here that the emperor would make sacrifices and pray to heaven and his ancestors at the winter solstice. As the Son of Heaven, the emperor could intercede with the gods, represented by their spirit tablets, on behalf of his people and pray for a good harvest. Off-limits to the common people during the Ming and Qing dynasties, the Temple of Heaven is situated in a large and pleasant park that now attracts early morning practitioners of Tai Ji Quan(shadowboxing). The main parts of the temple complex are all connected on the favored north-south axis by the Red Step Bridge (an elevated pathway) to form the focal point of the park. The Round Altar is made up of concentric rings of stone slabs in multiples of nine, the most auspicious number. The circular Echo Wall is famed for its supposed ability to carry a whisper from one side of the wall to the other.